While we're not exactly world travelers, we do hit the road (or the air) from time to time. During our trip to Fashion Week in NYC, I definitely learned a thing or two about what to bring. Miss Oops Rescue Sponge ($10) A portable deodorant stain-lifter, that helps get rid of deodorant marks, makeup powder and baby powder. Totally necessary while wearing the prerequisite black at Fashion Week. 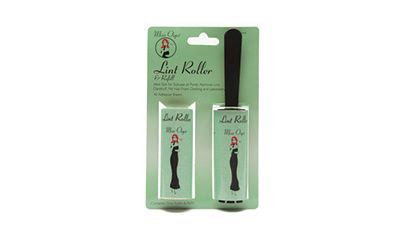 Miss Oops Lint Roller ($6) The most portable size and the most perfect essential for getting rid of the little threads, dust, and what-nots that will inevitably get stuck to you as you move about. Band Aid Blister Block ($7) If you are heading somewhere where major walking is involved, you need to buy this. So easy to use...it's like the size of a mini deodorant...all you do is rub it on your foot where the shoe would rub. It's utterly amazing. I wore flats and Christine wore heels and at the end of both days (where we were literally on our feet the entire day) we had absolutely no blisters. NONE. Secret Flawless Deodorant ($5) I've said it before and I'll say it again...this stuff if fabulous. Put it on in the morning and you are odor free all day. After using this I would move around and get a whiff of the underarms...come on, don't act like you've never checked yourself during the day people...and it still smelled fresh hours after application. Guess by Marciano Arm Candy Satchel ($90) I never take any of my expensive bags on trips like this...especially considering that we were going to be taking the train late at night. So out I went, purchased this and loved it. It's hard to tell, but it's a crinkly black patent...not as shiny as patent normally is. Totally love the of-the-moment multi-straps that allowed me to carry it across my body when I tired of carrying it over my shoulder. 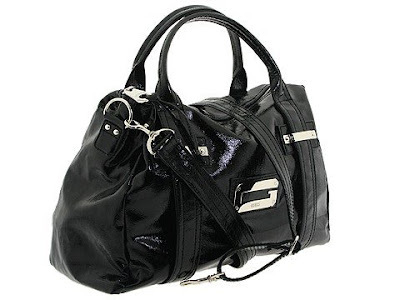 Extremely comfortable and large enough to handle a notepad, my Palm Centro, a camera, pens, wallet, makeup bag, etc. Chic enough to go with everything I brought with me. Any big bag will do...just depends on what you like the most. Well, you've heard a few of my essentials. I'd love to hear about some of your travel essentials in the comment section! great post ! And that bag looks awesome for $90 !! I agree I always carry band aids during travel.